Architecture is the second term in the title of the present book. The definition of architecture covers a wide field of human activities, which find its common denominator in the will to reshape the material into something else. The Greek word archi means upper and tektonikos points to an ability of building. Architecture is – in the classical Greek meaning – the art of superior building. This view comprises many types of creativity (in building), but there must be something more to make it architecture. 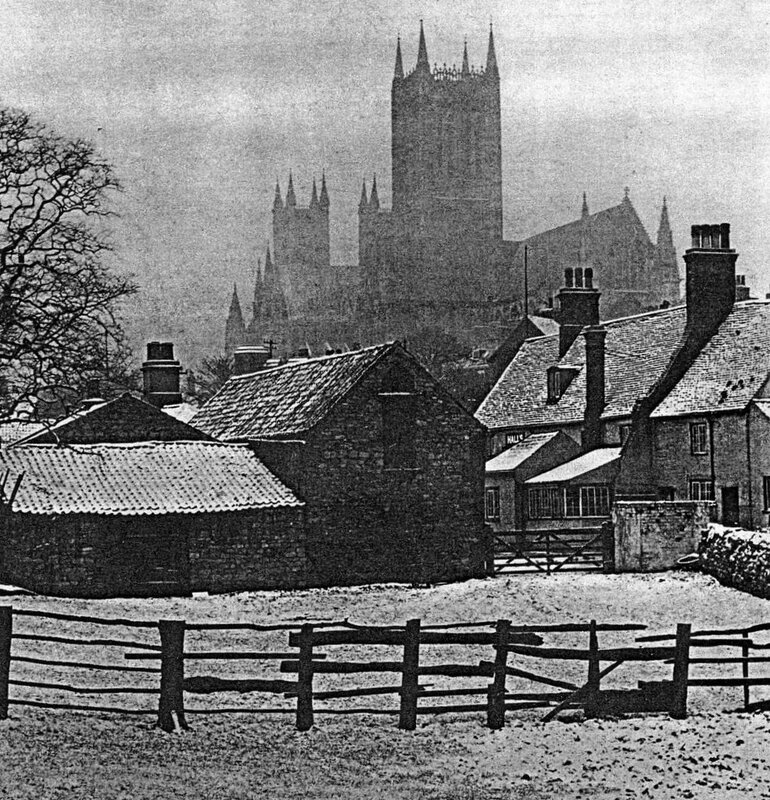 ‘A bicycle shed is a building; Lincoln Cathedral is a piece of architecture’ said Nikolaus PEVSNER (1943/1961) in the introduction of his ‘An Outline of European Architecture’. And he continued: ‘The term architecture applies only to buildings designed with a view to aesthetic appeal.’ The element of superiority (as given in the adjective archi) suggests a definite scale of competence. It is this subjective element of quality, which have kept the researchers of architecture busy for such a long time and will probably continue to do so. Where does architecture start? The Rationalists of the eighteenth century supported the idea that the roots of any construction activity must be found in a primitive hut or shelter, built from ready available materials. Such an outcome can be expected in a linear view of history, based on opposition thinking. The beginning has to be ‘primitive’, while our present state (that is in the eighteenth century) is one of highly developed culture. The first stage of searching is also the place of an invisible architecture. Building structures might have existed in the mind of the roaming people, looking for a place to live or worship their invisible gods. Their intuitions, however, never reached the stage of formalization. This searching with trial-and-error is not only a thing of the past. Modern architects and town planners go through the same phase of invisible invisibility. Every building has its secret history, established in a time before boundaries were fixed. The second phase of habituation sets in when the mind of people dwells for a certain time at a certain place. Ideas can materialize when a familiarity with the land is established. The first settlement might be in a hut in a wooded area, but can also consist of an overhang in an escarpment, a niche or a cave, which provided a shelter for the rain and cold. The imagination of the human race to use nature as a guideline in building results in a great variety of initial habitats. Modern architecture has to find it own mental escarpment to reconcile a whole corpus of ideas (about living) and provide them with shelter. The drawing board leads to the first discussions about feasibility, the first small-scale models must give an inside in the real thing, the start of the building process itself, with the transportation of materials to the side: all these activities contribute to the realization of an initial settlement. The subsequent building of structures, like the dry-built enclosures (in England and Ireland), a ‘burgh’ (Holland, fig. 3), ‘bawns’ (Ireland), or earthworks in general (in many other places) is a deliberate attempt to fence out some sort of danger. This peril could have many faces. It can come from nature itself, like harsh weather, dangerous animals or floods. Furthermore, jealous and/or power-obsessed fellow neighbors, eager for booty (like the Northmen in Northern Europe) had to be counteracted. Fig. 3 – Burgh, a small village in southwestern Holland (Zeeland), is an example of ‘early’ architecture, where ideas (of living) have found a practical application. The village bears in its name the initial defensive nature against the Northmen. These northern tribes roamed over Europe in the second half of the ninth century and brought (initially) death and destruction. The first architectonic efforts might have had the form of mounds, banks, ditches, walls and pits, or, like Hadrian ALLCROFT (1908) collectively described them, as ‘earthworks’. The shape of these ‘primitive’ settlement-defense systems can vary considerably. Many of them are circular (fig. 3/4), but the square form has also been used (fig. 5). All conceivable intermediate forms are present: some using precipices, cliffs or water as their boundaries (promontory fortresses), others follow geographic contours. Even if the latter are absent, like on a plateau or plain, the shape of (prehistoric) fortifications can vary sheer endlessly. Fig. 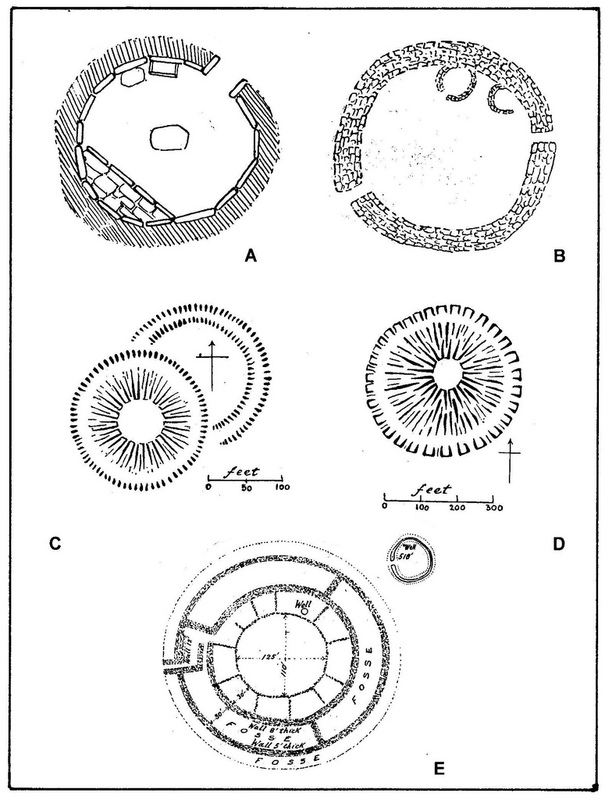 4 – Various circular architectural structures and/or defense systems, which indicate that the character of the (early) settlement had a component of defense in them right from the very beginning. 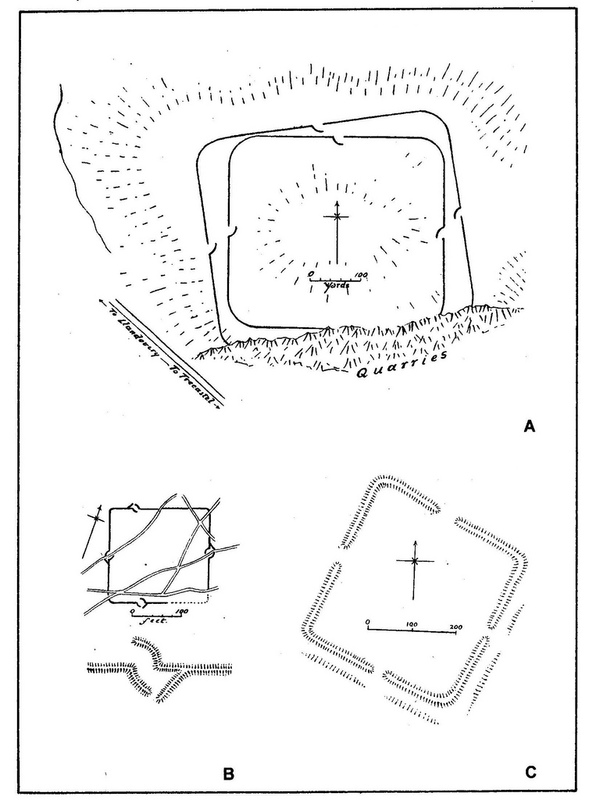 The illustrated primitive homesteads are located in Dartmoor (A), Baghan Galldair (B), Bride-stow, near Okehampton (C), Clifford’s Hill (D) and the hill-fort of Chun Castle (E). The Romans’ camp (or castrum) was laid down, in theory, as a right-angled parallelogram, its length one-third greater than its width, and its corners rounded. Its defenses consisted of a single vallum (bank) surrounded by a fosse (ditch). The vallum was planted by a palisade of stakes (valli). The proportions of the castra could vary considerably and the Romans were very practical engineers when the circumstances required it. 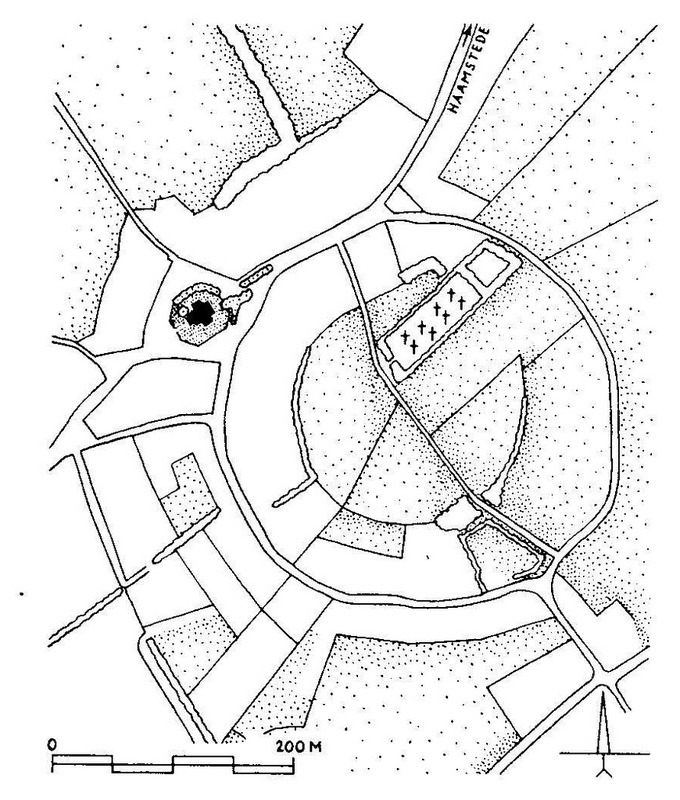 A complete square plan is found at Melandra (Derbyshire; fig. 5c), Porchester, Hard Knot, High Riechester, Ebchester, Bowes, Maryport, Brancaster, Kirkby Thore, Alchester, and elsewhere. Fig. 5 – Some examples of the square forms of various Roman camps (or castra) in England. The following plans are shown: A. Double banks at Piggwn Camps (Merionethshire); B. Double doors at Dealgin Ross (Strathearn); and C. Melandra (Derbyshire). The final stage in the history of building is the deliberate and subjective attempt to make sheltered living an aim in itself, knowing the depth of its stipulations by acknowledging the influence of division thinking (on the valuation). The intentions of a builder/architect will – at a certain stage in a cultural development – go beyond the practical application of such basic designs as the moated homestead, the circular hill-fort or the protecting fortress. After a stage of moral innocence comes an age of consideration and consciousness, knowing that the art of architecture should be addressed with knowledge and insight. 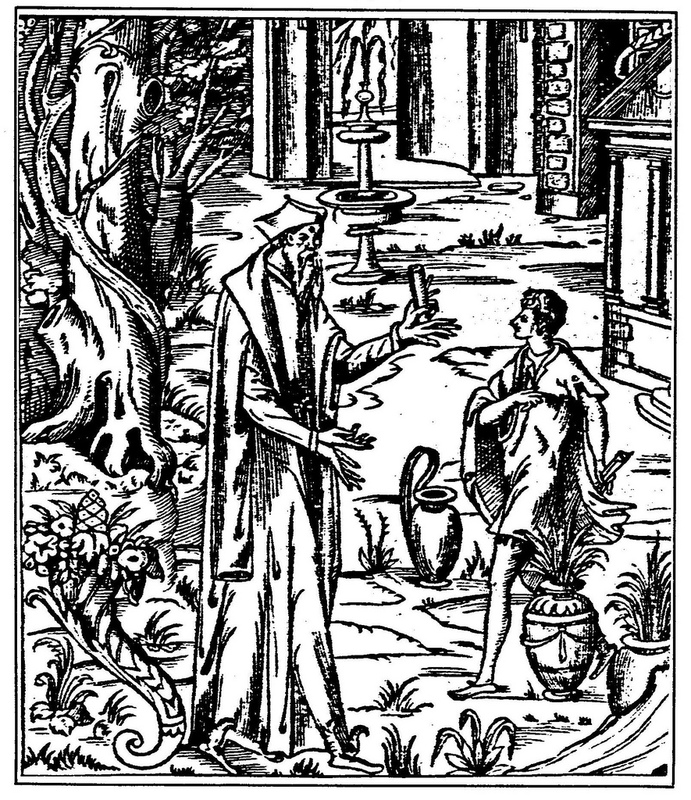 The Good Architect, said Philibert Delorme in 1567, should have ‘four hands, to show that he has to make and control many things in his time…’ (fig. 6). Architecture is in the end – which is also a beginning – a matter of relevance in which someone takes the responsibility to define form. The present inquiry will try to follow the various steps in this process, as it is an intrinsic part of the new approach to visibility in higher division thinking. The definition and choice (in architecture) might be the real moment of truth in the existence of an observer.